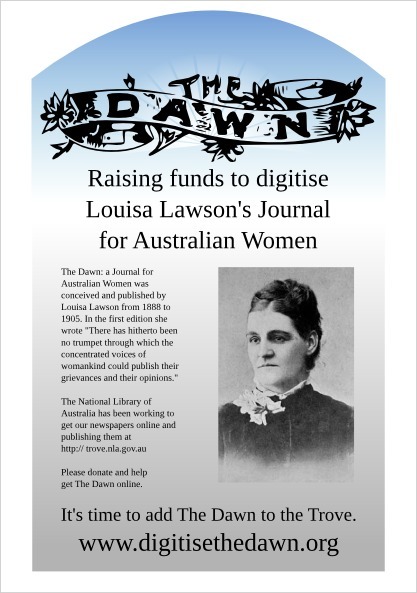 Louisa Lawson founded The Dawn: A Journal for Australian Women in 1888 and ran it for 17 years. She was a pivotal figure in winning women the right to vote in Australia, and her publication played a key role in the struggle for women's suffrage. Digitise The Dawn are raising funds so that the National Library can digitise The Dawn newspaper and add it to Trove. The Dawn contained reports on women's wrongs, helping to fight their battles and sue for their suffrage. It offered household advice, fashion, poetry, a short story and extensive reporting of women's activities both locally and overseas. As well as providing information about the times it was published in The Dawn could provide vital information to genealogists and local history researchers about the women who worked for Louisa Lawson and those who featured in the newspaper's articles. Thanks for raising this issue, Kylie. I have tweeted and will promote however I can.